The oldest members of Generation Z, born between 1995 and 2012, are reaching adulthood, making them the first adults to grow up natively fluent in digital technologies and social media. About 50 percent of Generation Z (or Gen Z) is connected to the internet upward of 10 hours per day via computers or mobile devices. Gen Z is constantly connected online, and most are inseparable from social media. Social workers who meet with Gen Z patients now incorporate elements of social media and internet technologies into their repertoire to better reach young people. This irrepressible evolution of digital technologies drives the social, economic, and cultural forces at work in Generation Z and will continue to thrive well into the foreseeable future. Students seeking an online master’s degree in social work can find themselves incorporating social media into their studies and into the social work industry at large in an effort to reach internet-savvy Gen Z. Today, nearly everyone has a smartphone, a tablet, and/or a computer of some sort. According to CIA.gov, almost 247 million people are online in the United States alone (July 2016 estimation). That’s more than three-quarters of the total population of the U.S. The International Telecommunications Union reports in “ICT Facts And Figures 2017” that mobile broadband subscriptions (smartphone service) are up nearly 30 percent since 2012 in developed countries, and that mobile internet access is common regardless of socioeconomic status. The line between the “real” world and the internet world hardly exists for Gen Z, regardless of their income bracket. Their experiences are both real and digital all at once. Millennials may also be internet savvy because they have learned digital technologies through and through, but Gen Z “thinks” in terms of digital media much the same way a native speaker automatically communicates in his or her native tongue. Because Gen Z is so well versed in digital media, traditional television broadcasts, cable TV services, and radio take a back seat to over-the-top (OTT) services such as YouTube, Netflix, and Instagram. The social work industry is finding that OTT platforms should be incorporated into social strategies to reach Gen Z. This approach can include using influencers to spread social messages and promote social programs, producing informative videos on YouTube, and using social media to spread news about social welfare programs and relief services. One example is model Will Jardell’s YouTube presentation on Safe Place for Youth (SPY). SPY reached out to the America’s Next Top Model runner-up, who commands a large following of Gen Z’ers on social media, to devote a segment to the organization. The American Institute of CPAs (AICPA) provides valuable insight into Gen Z’s values, habits, behaviors, and goals in its “11 Things To Know About Gen Z Workers.” According to AICPA, Gen Z values diversity, chases experiences over possessions, prefers an independent work environment, values the importance of “personal brand,” and is largely self-educating. Gen Z represents a substantial shift from the way previous generations handled similar circumstances, so the social work field must adjust its approach to service a new kind of client. If done correctly, however, social workers can enjoy a much closer, more beneficial relationship with their clientele than ever before. Robbins and Singer note that sites such as Twitter allow for close, up-to-the-minute information from organizations and people who affect social programs and services. Social workers themselves can also share work experiences online and reach a wide audience of people who may need help they otherwise might not have known about. For instance, the New Jersey Chapter of the long-standing youth organization YMCA operates a very active Twitter account, publishing seasonal program schedules (ranging from swimming to sports and art), inspirational quotes and photos, links to articles that deliver pertinent information for young people, and coverage of YMCA events. The line between social worker and client is blurring in the digital world. Instead of a one-way street, social work is becoming a symbiotic circle, thanks to the digital prowess of Gen Z. Social workers are reaching more who need help, and those who need help are teaching social workers more about the problems they face, allowing social workers to improve their services. Students seeking to earn their master’s in social work online and become licensed social workers may be members of Generation Z themselves. 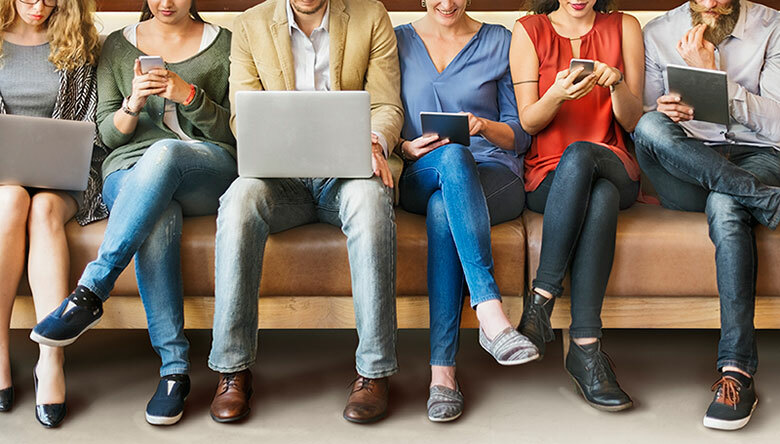 Case Western Reserve’s online curriculum and environment reflect Gen Z’s growing tendency toward a connected, digital world, and prepares graduates to bring their technical fluency into their social work careers. Case Western Reserve University’s Jack, Joseph, and Morton Mandel School of Applied Social Sciences is ranked among the top ten social work graduate schools by U.S. News & World Report and offers a Master of Science in Social Administration (MSSA) program online. The coursework blends seamlessly with hands-on field experience in three concentrations: Community Practice for Social Change, Direct Practice (Children, Youth, and Families), and Direct Practice (Mental Health with Adults).